During the retroperitoneal approach the patient is positioned in the standard 90° full flank position. 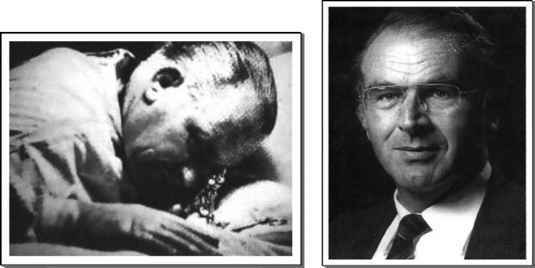 The surgeon and the assistant stand facing the patient's back (5). A three-port technique is usually employed. The initial retroperitoneal access is achieved using the open (Hasson) technique. A 1.2 cm transverse skin incision is made at the tip of the 12th rib, and flank muscles are bluntly split. The thoracolumbar fascia is exposed and incised. Using blunt finger dissection, the retroperitoneum is entered and a space is developed anterior to the psoas muscle and posterior to Gerota's fascia. A balloon dilator is inserted in the created retroperitoneal space, and then inflated with 800 cc of air. The balloon is subsequently deflated and replaced with a 10 mm blunt tip cannula with a 30 cc balloon mounted tip which is cinched against the abdominal wall in an air tight fashion. CO2 pneumoretroperitoneum is established at 15 mmHg, and a 30° lens laparoscope is introduced into the retroperitoneal space. Under direct vision, two secondary laparoscopic ports are placed. An anterior port is inserted 3 cm cepha-lad to the iliac crest along the anterior axillary line, and a posterior port is inserted at the junction of the lateral border of the erector spinae muscle with the undersurface of the 12th rib (Fig. 9). 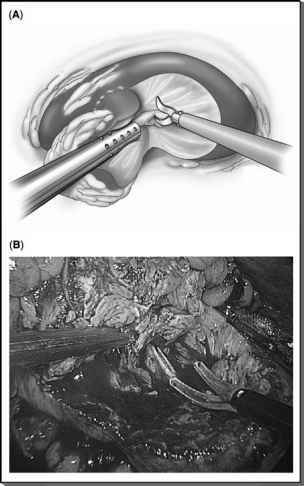 FIGURE5 ■ Illustration (A) and intraoperative photo (B) of renal tumor excision with deliberate entering to the calyx abutting the tumor as necessary to maintain an adequate parenchymal margin. 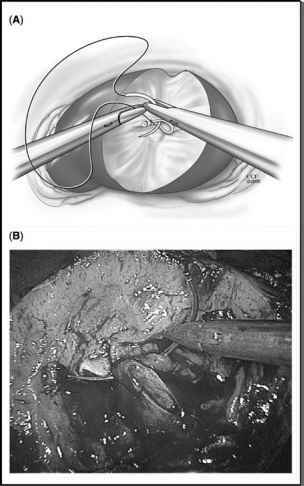 FIGURE 6 ■ Illustration (A) and intraoperative photo (B) showing suture repairing of any calyceal opening in a watertight fashion. After tumor excision, retrograde injection of methylene blue help identify and, later, confirm watertight repair of calyceal entry. In contradistinction to the transperi-toneal approach, identification and individual dissection of the renal artery and renal vein is the first surgical step in the retroperitoneal approach. The renal hilum is put on stretch by anteriolateral retraction of the kidney. The renal artery and vein are individually dissected in preparation for temporary clamping. In contradistinction to the transperitoneal approach, identification and individual dissection of the renal artery and renal vein is the first surgical step in the retroperitoneal approach. The kidney is mobilized from within the Gerota's fascia in a fashion similar to the transperitoneal approach. Nevertheless, the retroperitoneal space is limited adding difficulty to the procedure. 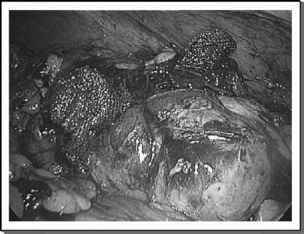 Bulldog clamps are placed on the renal artery and vein separately during a retroperi-toneal partial nephrectomy (Fig. 10). Following hilar control, surgical steps including tumor excision, reconstruction of the renal parenchyma and collecting system, tumor extraction, and laparoscopic exit are similar to the transperitoneal approach. FIGURE 7 ■ (A) Hemostatic sutures are placed deep in the renal parenchyma using a CTX needle. The sutures are cinched tightly over prepared Surgicel® bolsters positioned in the parenchymal defect. 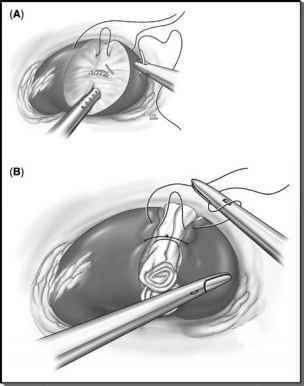 (B) Intraoperative illustration of renal parenchymal repair. FIGURE8 ■ Intraoperative photo of completed parenchymal suturing and unclamped renal hilum. Surgicel® bolsters fill the parenchymal defect at the site of excised renal tumor.